Beautiful View of Pilot Mountain, N. C.
This all wooded 2.9 acres gives you privacy and building sites with long range mountain views! Nestled in the Blue Ridge Mountains of Virginia, 7 miles from the Blue Ridge Parkway you will find Longview Estates. This 2.9 acre tract has a 75 mile view of Pilot Mountain NC. Wooded, surveyed with a nice home site. A restricted development, we have 3 lots to offer. Two of the tracts, approx. 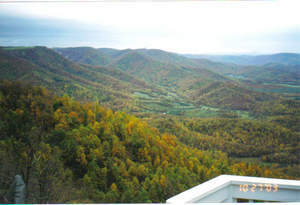 2 acres each look out over the Woolwine Valley and have long range views of the Virginia Mountains. These lots are accessible from highway 58 which is the major road in Patrick County. You, therefore, have fantastic views, convenience and seclusion on gorgeous building sites.